Decatur GA AFRICAN HAIR BRAIDING at Winners african Hair braiding. Winners african hair braiding Decatur GA is the best African Hair Braiding in Decatur GA and the best African Hair Braiding Salon & Shop in Decatur GA area. We are Winners african Hair braiding, Professional Hair Braiding Salon in Decatur GA Looking for African Hair Braiding in Decatur GA? Look no further, we are the Best African Hair Braiding Decatur GA, the best African hair braiding shop in Decatur and the #1 African hair braiding salon in Decatur GA. At Winners african Hair braiding you will find the most Professional African Hair Braiders in Decatur GA. Choose Winners African Hair Braiding today. Hair Braiding in Decatur ga. Clearly the Best African Hair Braiding salon in Decatur ga, Winners african Hair braiding Salon is the premier Hair Braiding Salon in Decatur ga that specializes in African Hair braiding Styles and Weaves. The Best Hair Braiding in Decatur GA is Winners african Hair braiding - Hair Braiding salon in Decatur GA. We have been voted the best African hair braiding shop in Decatur GA. We offer Hair Braiding Coupons in Decatur GA, hair Braiding Deals in Decatur GA, Hair Braiding Discounts and Offers in Decatur GA. At Winners african Hair braiding - Hair Braiding salon in Decatur GA Salon The Best Hair Braiding in Decatur GA is Winners Hair Braiding - Hair Braiding salon in Decatur GA. We have been voted the best African hair braiding shop in Decatur GA. We offer Hair Braiding Coupons in Decatur GA, hair Braiding Deals in Decatur GA, Hair Braiding Discounts and Offers in Decatur GA. At Winners Hair Braiding - Hair Braiding salon in Decatur GA Salon Best Hair Braiding salon in Decatur GA, Winners Hair Braiding - Hair Braiding salon in Decatur GA features a beautiful salon where your Hair braiding experience is nothing but the best. Our patrons make sure that you are comfortable and strive everyday to give you nothing short of the best Hair braiding eperience you've ever had. From an assortment of popular hair braiding styles to custom Hair braiding designs you are sure to look your best everytime you leave our salon. Winners Hair Braiding Located at 2714 Wesley chapel Rd, Decatur,Georgia, Georgia 30034 $30 - $1000 https://cdn4.mivasocial.com/wp-content/uploads/sites/258/2018/05/logotop1.png 404-604-8735. http://www.winnersbraiding.com.com. Felt like I was at home in my living room getting my hair done watching movies. Very Happy with Winners Hair braiding. Not being from Atlanta Ga I heard about this place through word of mouth. Not only was I in and out in about six hours getting micros, the ladies made it feel like I was at home in my living room getting my hair done watching movies. The braids came out so beautiful I know that I will always use them in the future. 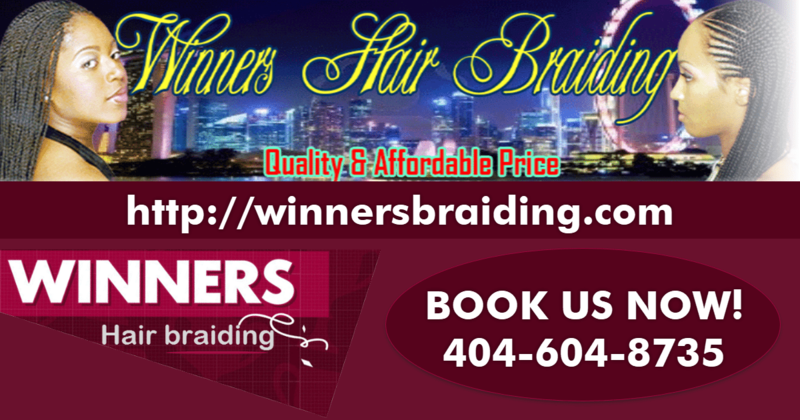 Winners Hair Braiding Salon is a team of professional hair braiding experts with many years of experience serving the Decatur GA and Metro Atlanta areas. At Winners Hair braiding, our priority is to provide you with the appropriate hair care and hair braiding style you deserve without damaging your scalp or hair. Hair Braiding in Decatur ga. Clearly the Best African Hair Braiding salon in Decatur ga, Winners Hair Braiding Salon is the premier Hair Braiding Salon in Decatur ga that specializes in African Hair braiding Styles and Weaves.